Made for Mountaineering and Rock Climbing the Clean Mountain Can from Geo Toilet Systems has been to the top of Mt. Everest, Kilimanjaro and McKinley. The CMC is required by Denali National Park when climbing Mt. McKinley and is being used, along with Restop Bags by the Eco Everest Expedition for the second year in a row. The CMC is the smallest, lightest and strongest personal toilet available. It holds almost 2 gallons of human waste and has a DOT approved two way vent in the screw down lid to adjust for pressure changes at varying elevations. 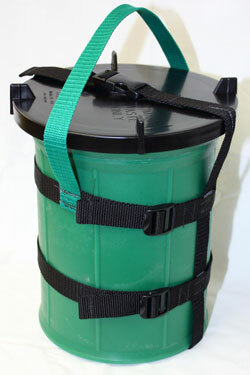 It comes with a harness system to strap to a pack, rope or sled. The durable CMC is sturdy enough to be sat on and in 5 testing trials, a CMC filled 3/4 full with solid ice was dropped 4 feet onto concrete at a temperature of 0 Fahrenheit without damage. The CMC is designed to have its contents dumped directly out or be lined with a biodegradable bag such as Restop 2 or Wag Bags.